Ski & snowboard rental equipment for the 2018-2019 season. Park City Sport rents well-maintained, high quality equipment purchased new every season. Junior equipment, snow blades, and rental helmets & clothing are also available. 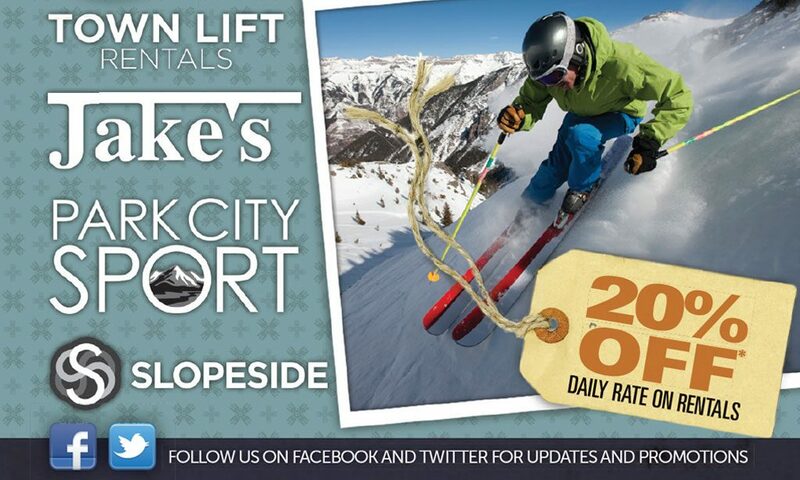 20% Off Online Ski & Snowboard Rentals! At Park City Sport, we offer a number of ski package rentals to suit each individual skier’s needs. From basic beginner skis to the top of the line demo package, we have exactly what you are looking for. Every year we carry new skis from all of the top brands in the industry. Blizzard, Elan, Rossignol, Salomon, Volkl and many more for you to try on your ski vacation to Park City. We also carry junior skis & snowboards as well as snowblades! Our sport package is for the beginner skier to low-intermediate. With soft edges & a flexible core, this makes the skis easy to maneuver for those just getting started. They perform well at slower speeds giving the skier confidence & control combined with ease of turning. The performance package is our middle ski package for low-intermediate skiers all the way to the advanced skier. The skis offered in this package are a mid-range all mountain ski to suit the majority of skiers visiting the Park City, UT area. At a short bump up in price from the sport package, the performance skis are high quality & give great performance on the mountain. The Demo skis that Park City Sport carries are only top of the line, high performance skis. Skis in this package are stable skis with a variety of rides. They are not as forgiving as the performance package as they are meant for aggressive & advanced skiers. From name brands like Atomic, Blizzard, Elan, Head, Rossignol, and Volkl, we have a wide variety of skis in this package to show off the latest and greatest skis in production in 2018-2019. We carry two different snowboard packages at Slopeside Sports. The boards we carry are by Rossignol & Burton, who make some of the best quality snowboards in the industry. From a basic snowboard to the advanced demo boards, you can enjoy any resort in Park City. Our basic snowboards are meant for a beginner to a low-intermediate type of rider. With a soft core & edges this board is easy to turn in the snow for those looking to start slow. The demo snowboards we carry for the 2016-2017 ski season is one of Burton’s best, the Progression, as well as Rossignol MagTek.